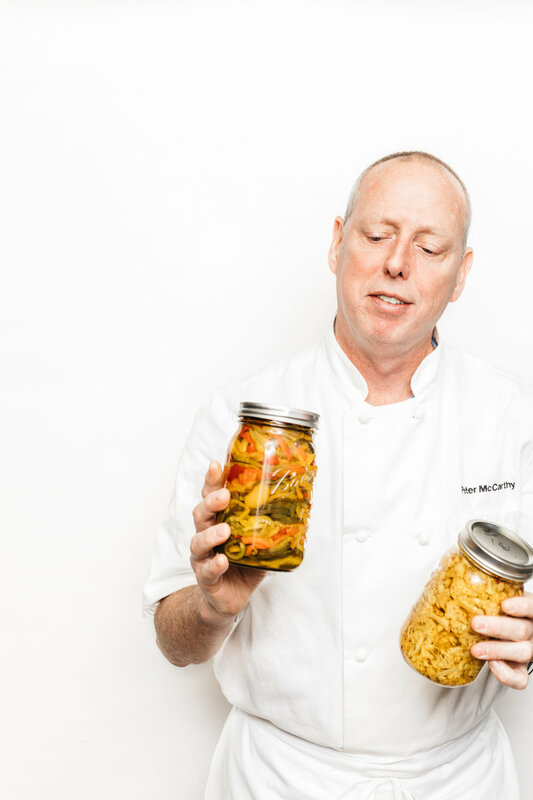 It was 16° outside when I met EVOO co-owner Peter McCarthy at his Kendall Square restaurant. With no hint of spring in the air, McCarthy’s menu suggested otherwise. 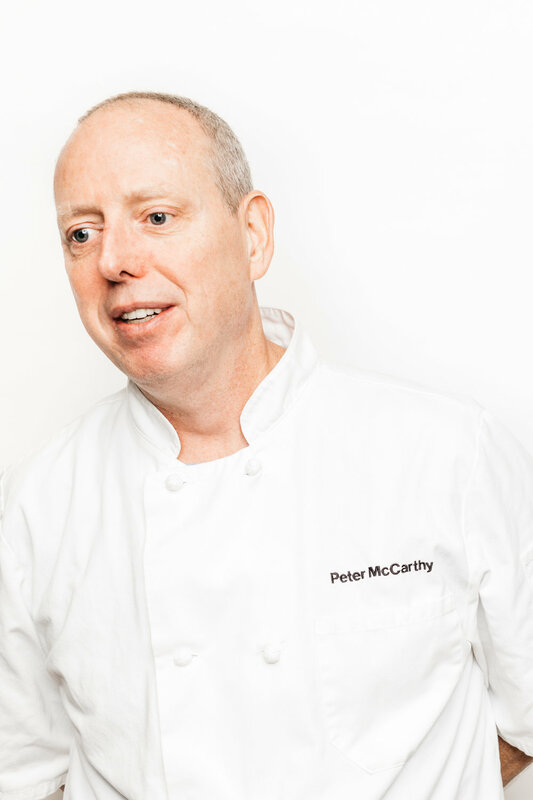 Known for his support of local food growers, McCarthy learned to extend their seasonal offerings, bridging the gap between winter’s root vegetables and the start of the New England growing season. During a tour of his kitchen, McCarthy described the cabinets laden with jars of pickled vegetables and a freezer full of frozen fruit. On his menu, each item is identified by source: cucumbers and cauliflower (pickled) from Pepperell; lettuce from Sheffield, rock shrimp from Wellesley. McCarthy’s support of sustainable measures extends into EVOO’s physical space—from floors of reclaimed wood to a rooftop garden—all within a LEED Gold Certified building. EDIBLE BOSTON: In 1998, EVOO’s original location was in Somerville. What was Kendall Square like when you arrived in 2010 and how has it changed? 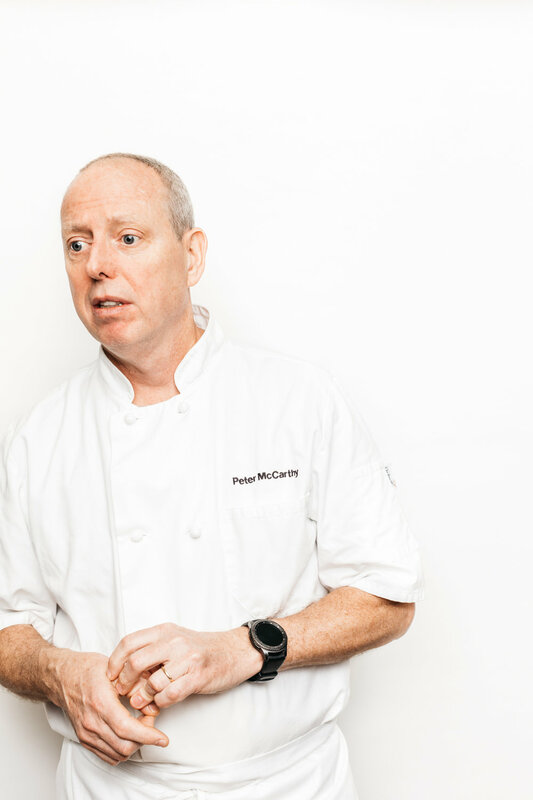 PETER McCARTHY: When we first moved to Kendall Square we felt it was full of potential, there were no other restaurants in the immediate vicinity. Everywhere we looked, buildings were going up at breakneck speed. All of the pharmaceutical and high-tech companies, the close proximity to MIT, the Red Line T stop, the overflowing parking garages and being walking distance from Boston, all made for a very enticing location. Now, eight years later, there are many more restaurants, possibly too many, buildings are still going up in the blink of an eye and we’re still thinking that there is so much potential here. [Yet] Kendall Square was—and still is—a ghost town on weekends. Currently there is not much to bring people into the area. In our original location weekend nights were our bread and butter; in Kendall they are the slowest nights of the week. 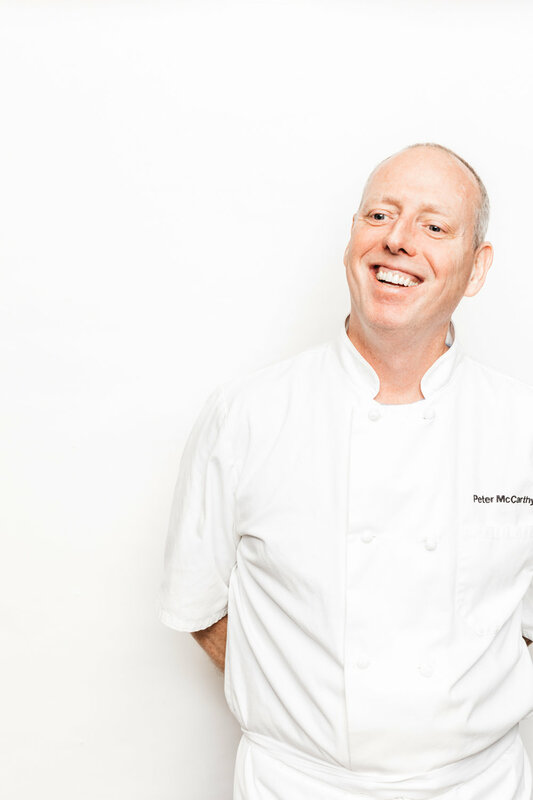 You’ve been described as a great example of an “under-the-radar chef,” quietly walking the walk with serious longevity. How do you do it? Our intent has always been to be in it for the long haul and to build a restaurant where I would be on the line most nights, cooking the type of food I wanted to eat and not taking it [or] myself too seriously. Establishing meaningful relationships with our employees, farm partners and customers was more important to us than any “Best Of” award. I felt—and still feel—that if we did a good job people would come in and join us. I still work on the line most shifts. [My wife] Colleen works as front-of-the-house manager a couple of nights a week; she is constantly juggling her schedule, being a mom first, restaurant owner second and then as a CPA she handles the financial side of the business. While newer restaurants have opened and closed, EVOO remains consistently strong. What’s your formula for success? Be there! Be at the restaurant, sweat the details, be willing to change, as long as the change fits within your ideals. We have had our ups and downs. Back in 1998, after our first six months of being open [in Somerville], I wasn’t sure we would make it to a year, but word got out, we received some good reviews and business boomed. We have had times where we needed to tighten the belt; 20 years is a long time and we have felt the economic turns during that time. Less than a year after opening, EVOO was named “One of the Best New Restaurants in America” by Bon Appetit magazine. I remember that making my day. You have been a big advocate of using available ingredients, sourcing it on your menu right down to the pickled cucumbers! But your commitment goes beyond the traditional growing season … how do you maintain local year-round? Maintaining local year-round has become much easier. In our infancy we struggled to find local ingredients and not just during the winter months. There were only a few farmers willing to deliver to restaurants; every town didn’t have a weekly market. Now with more farmers having root cellars and heated greenhouses, and being more willing to deliver to restaurants, it’s become a lot easier. Throughout the years we have grown our network of farm partners from a handful to dozens. In our first few years we were buying herbs and greens from Eva Sommaripa, vegetables from Verrill Farms. These were the only farms we were buying from. Twenty years into it, all of our land-based protein comes from small independent local farms. The chicken we use is from Feather Brook Farm in Raynham. Most of the beef we use comes from Andy Carbone; he is the means by which several local beef farms process and distribute their meat. The little beef that Andy can’t supply us with comes to us from Maine Family Farms, a collaborative of independent eastern New England farms. Another great resource for us has been Metro Pedal Power, a Somerville-based bicycle distribution service. The farms only have to bring their products to Metro Ped’s warehouse instead of driving all over the city bringing one small order after another to each restaurant and dealing with the traffic and the opposite hours that restaurateurs keep from farmers. You and your staff preserve and freeze summer produce for use in the colder months. Exactly what is your process? In an effort to extend the availability of local ingredients on our menu and to further support our farm partners we started canning. Now we pickle from early spring straight through the autumn frost. We can fruit jams and jellies: strawberry, raspberry, blackberry, plum and Concord grape. We freeze berries, mostly raspberries, smooshing them flat into vacuum-sealed bags. We also freeze corn, enough for a special treat during the winter doldrums of root vegetables. We can some of the sweet overripe field tomatoes, but mostly we oven-dry plum tomatoes tossing them with some EVOO, salt and citric acid and then drying them before vacuum-sealing them. How do your customers know that the frozen or preserved vegetables are still local in January? We proudly list the local sources right on our menu. If an item is one that we preserved, we list it, such as Cucumbers (pickled), Raspberries (frozen), Tomatoes (oven-dried). What we can’t get locally we do source from only the best local distributors. You will never see a national distributor pull up in front of EVOO. With two kids—Shane, 14, and Cate, 11—do you maintain a local-only kitchen at home and how do you get them interested in healthy food? I think the best answer is to start a garden with them, showing them where food comes from and how it is grown, teaching them to respect food. We are not perfect eaters, and yes, like most other households we do have a pantry full of sugary cereals, granola bars and other kid favorites. What are your top three dishes? Secondly, Cornmeal Fried Oysters with Apple-Bacon Salsa and Goat Cheese Fondue. I came up with this dish as an argument to those who say fish and cheese should not be paired together. This dish works perfectly, the crispy edges of the rich, briny fried oysters pair wonderfully with the creaminess of the fondue and smoky tartness of the salsa. My third choice would be Roasted Garlic-Mushroom Flan, utilizing local mushrooms foraged and dried by our friend Ben Maleson. I didn’t really gain an appreciation for good food until I was cooking and discovering it myself. I applied to The Culinary Institute of America in Hyde Park, New York. Upon graduation I started working at Seasons Restaurant in The Bostonian Hotel. I was able to cook in the same kitchen that Jasper White, Lydia Shire, Gordon Hamersley, Jody Adams and Billy Poirier had built. EVOO is now 20 years old, so how have you maintained your stamina? I have settled into a sort of routine. During the busier seasons, I work a ton of hours. During slower times I have trained myself to get out of Dodge and get a lot of rest, spending quality time with my family. I exercise regularly; this combined with a mediocre diet, barely enough sleep and truly enjoying what I do keeps me going. What advice would you offer a newcomer to the restaurant scene, especially in Cambridge? Location, location, location. I know it’s cliché, but, even if you’re a great chef with great staff, it can be very hard to overcome a lousy location. When you were growing up, what was your favorite dish? My favorite food memory is fishing on my family’s boat when I was growing up. We’d head out in the morning and return in the late afternoon with a bucket full of flounder. Mom would take some of these just-filleted flounders, dipping them in flour and then in egg, shallow frying them in a lot of butter on the little two-burner stove in the boat’s galley. Passing them out in waves as they came out of the pan. And the question I am sure you get on a regular basis, why the name EVOO? While writing a recipe, instead of writing out extra-virgin olive oil, I used the acronym EVOO. It dawned on me that EVOO may be a good name candidate. That night I suggested it to Colleen, she didn’t like it. She thought that no one would know what it means, which they didn’t and many still don’t. Since I am blind, I always ask people to describe themselves … would you mind? I’m a middle-aged, follicly impaired, marginally fit, fairskinned, white guy with no tattoos or piercings and a crooked nose.